Spiritual investigator Richard Lawrence looks at the evidence for extraterrestrial contact and attempts to explain why aliens are so interested in us. 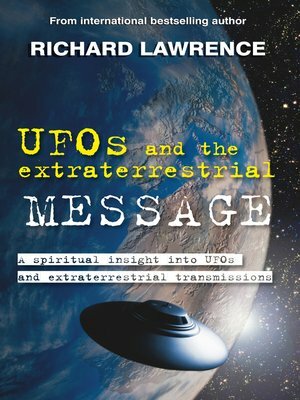 In this unique investigation of cosmic communication, Richard Lawrence presents the evidence for extraterrestrial contact in a whole new light, examining how these benign beings might offer humanity a rare opportunity for spiritual evolution. From creation myths and the big UFO theories to little-known eyewitness accounts, X-file exposes and his fascinating personal experience of alien contact, Richard also looks at channelled messages from alien beings - and reveals how these messages hold the key to our own cosmic intelligence. Enlightening and controversial, he answers many of our questions about aliens but reveals, too, that understanding the greater universe can be part of our own journey towards higher consciousness in our everyday lives. Richard Lawrence is an award-winning author. He has written extensively on guardian angels, prayer, meditation and many other aspects of personal development and empowerment. A world-renowned UFO expert and spiritual investigator, Richard was the first to bring declassified CIA and Pentagon UFO files to Britain in 1980. He is a popular broadcaster and is the author of Prayer Energy (CICO Books), the award-winning Gods, Guides and Guardian Angels and many more.